Bring your alignment, flexibility, and balance up to a whole new level with the use of our 6 Foot Pinch Buckle Cotton Yoga Strap. The durable plastic pinch buckle literally locks your strap in place; we created the buckle mechanism to be fully adjustable — making quick and effective adjustments so easy that you can do it with one hand! Our cotton straps are thick and textured so they won’t slip out of sweaty hands. Plus, at 1.5 inches wide, they are not only easy to grab they also do not cut off circulation! Our 6 foot strap is suitable for most yogis, but if you are over 6 feet tall, we offer this same exact yoga strap in a 8 foot option. I am so glad that I got this for myself. I've been using towels as a strap when doing yoga or arm stretches. I love the straps more than the towels as it's thin and not bulky like towels were. True product. The purple color is a true purple. I'm very well pleased with this strap. 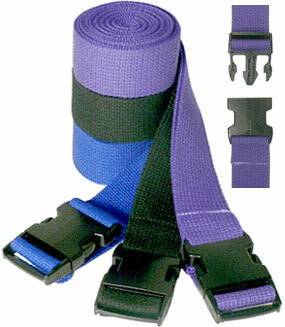 The strap is very dependable and it doesn''t slip. Strong and sturdy and all that I needed! I have been looking for a strap that has a snap in buckle and I finally found it here at Yoga Accessories. The buckle is super strong and keeps my mind at easy when in difficult stretches where I am placing tremendous pressure on the buckle. It can take it! I am an elderly woman and I need a strap to get into poses nowadays. Some of the others are difficult to get into place but this one with the snap buckle is easy and that is good for me. The snap buckle is so easy to use and I''m not fumbling to get it in. I wouldn''t use any other strap. I always had trouble in yoga class and this strap helps me get into hard poses. The buckle is so easy to use.